Arya loves books with unique features. Noisy Monsters by Roger Priddy has a purple noisy button in the lower right corner that made it an instant hit with my daughter. The funny front cover with a one-eyed blue monster and contrasting color scheme also made the book stand out on the shelf. Noisy Monsters doesn’t have a normal storyline. Each page shows a collection of weird monsters in different environments. Monsters have different colors, shapes, and numbers of eyes and limbs. Each monster has a unique name which is shown in text immediately below the monster. Additional text describes the various scenes and each page ends with a question about the activity on the page. 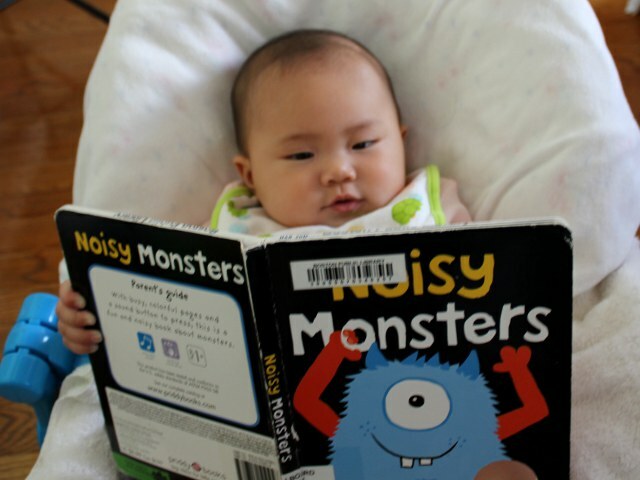 With scattered text placed randomly around each page, Noisy Monsters is a difficult book for children to read by themselves. However, it is a great book for adults to read to young children. The question at the end of every page encourages conversation and the distinct backgrounds provides lots of opportunity to talk about the pictures. The illustrations are colorful and strange. Multi-eyed monsters with lots of limbs are obvious objects of attraction. The array of backgrounds also provides children with lots of opportunity to identify new things on every page. My baby enjoyed looking at the pictures and kept slapping at the brightly colored monsters. The purple noise button is the best aspect of Noisy Monsters. The button produces a cackling laugh with every push. Since the button is large and located at the bottom of the page it is in great position for even the smallest babies to push by themselves. I liked pushing the button while reading it to my daughter every time she was done looking at the illustrations on any specific page. The combination of amusing images and conversation-inducing text makes Noisy Monsters a great choice for parents to read to their children. The purple noise button makes the book even better for easily-distracted young readers to read the book themselves. Thankfully the noise is soft enough so that the sound doesn’t carry from a neighboring room. Noisy Monsters costs (including shipping) under $7 new and under $5 used from Amazon.